On Wednesday which led to a bearish scenario as price now remain choppy; deciding on the next play out. Following a strong bearish sentiment since mid-March, ETHBTC heads for close support which is likely to witness a rebound or a break. Before now, ETHUSD was trading below $150 for the past three weeks before the April 2 price increase that surged price to $175 high. Constructing a rising wedge, the token retraced and further rally to the peak of $185; reaching a tight angle of the trend line. ETHUSD, 4H Chart – April 13. From the bullish wedge pattern, on Wednesday, Ethereum broke down heavily to $161; and has since been choppy – a sign of an indecisive market. While consolidating, a bullish play is likely to retest the break level at $180 resistance. A bearish play, however, could drop ETH to the bottom of $150 support. On the 4-hours RSI, a divergence move is revealed as Ethereum is currently positioned horizontally at 40 line. 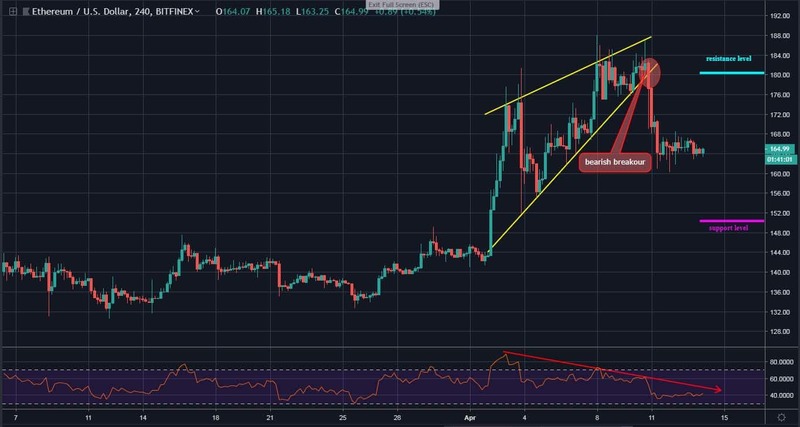 Since March 14, Ethereum has been following a bearish sentiment as price trade within a wedge range. Slowly, selling pressure is reaching the bottom of the lower trend line at 0.0315 BTC support. ETHBTC, 4H Chart – April 13. 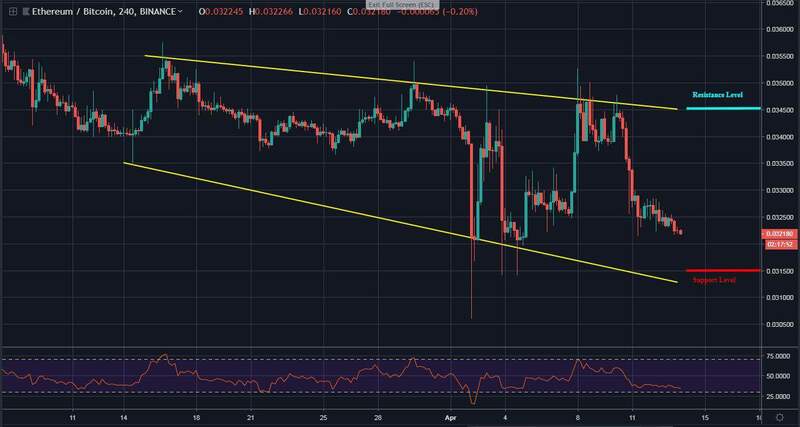 A test at the mentioned support is likely to witness a price rejection as the token bounce up to touch the upper trend line at 0.0345 BTC resistance level, ranging in a wedge. Breaching up the resistance level could propel price to 0.0355 BTC resistance and above. The 4-hours RSI is revealed near the 30 line; reaching the oversold territory may throw a price at the 0.0315 BTC support level. if the price falls below this support level, ETHBTC may set a new low at around 0.03 BTC.